Want to learn more about Mean Streets of Gadgetzan ? Head on over to our Mean Streets of Gadgetzan guide! Join the discussion on our forums! Come discuss Smuggler's Crate over in our dedicated Smuggler's Crate discussion topic. Give a random Beast in your hand +2/+2. Are you sure these are the crates that are supposed to go to the Gadgetzan petting zoo? I just like the grimy goon direction for hunter. swaying more away from smorcing to a more midrange and control archtype. Premium card actually. This is very strong because it's a power turn 1 play. 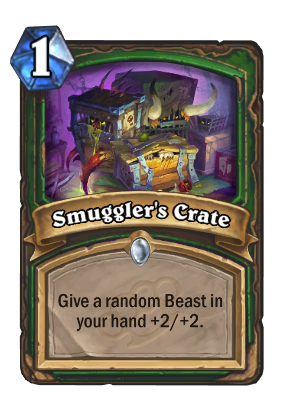 It should be x2 in midrange hunters, and more then ever they will be almost full beasts and run x2 houndmaster as well. So 15/15 King Krush incoming at Turn 9? You want this to hit rats or the kodo not the 1-2 drops. It's great card tho even if it hits only the grandma. I expect hunter around 4th best class. Above the average for sure, and might bully druid but druid wins vs priest and priest probably wins vs hunter ? Shaman will be the best before anything rotates (they are the best, they got buffed so no question here). So Shaman > [Druid / Priest / Hunter] > [Warrior / Mage] > Lock > Rogue > Pally ? SICK IN CHARGE DECK WITH WOLFRIDERS AND ARGENT HORSERIDER!!! it's much better then bat. But they will be both x2 in midrange hunter. I quite like this card because you can play this and then play the buffed beast immediately on turn 2 or 3. Newt would prefer to call it a briefcase, rather than a crate.